The Digital Library of Georgia has announce the availability of a new online resource: African American Funeral Programs from the East Central Georgia Regional Library. 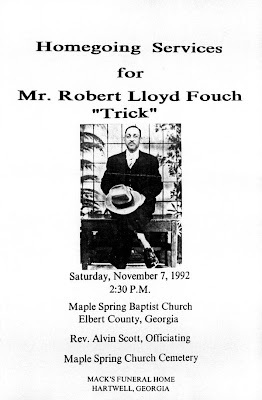 The African American Funeral Programs from the East Central Georgia Regional Library online collection consists of over one thousand funeral programs ranging from 1933 to 2008 (with the bulk of the collection beginning in the 1960s) from the Eula M. Ramsey Johnson Memorial Funeral Program Collection. A majority of the programs are from churches in Augusta, Georgia, and the surrounding area, with a few outliers in other states such as New York and Florida. The programs typically contain a photograph of the deceased, an obituary, a list of surviving relatives, and the order of service. The collection provides extensive genealogical information about the deceased, including birth and death dates, maiden names, names of relatives, past residences, and place of burial. Alongside this genealogical information, the obituaries provide a rich source of local history about African Americans. Many of the people included in this collection were prominent in their communities, and many were involved locally in the struggle for civil rights. Additional digitization projects are currently underway and will be announced as they become available online at the Digital Library of Georgia. Based at the University of Georgia Libraries, the Digital Library of Georgia is an initiative of GALILEO, the state's virtual library. Eula M. Ramsey Johnson Memorial Funeral Program Collection. East Central Georgia Regional Library. Presented in the Digital Library of Georgia. This is the citation required by the library for permission to post.